Students from over 35 exchange programs and academic institutions gathered at the Ambassador’s residence in Beijing for the special reception. Ambassador Branstad recognizes importance of American students in China; urges more Americans to consider study in China. Beijing, Oct. 20, 2017 – Last Friday, U.S. Ambassador to China, Terry Branstad, welcomed nearly 100 guests into his new Beijing home for a welcome reception with Project Pengyou, the flagship program of the Golden Bridges Foundation, and the U.S.-China Strong Foundation, to stress the importance of people-to-people exchange for the future of U.S.-China relations. Now five months into his appointment as U.S. Ambassador to China, Branstad is a longtime “friend of China”, having famously offered Midwestern hospitality to current Chinese President, Xi Jinping, in 1985 when Xi was visiting Iowa as a county party secretary of Hebei province. 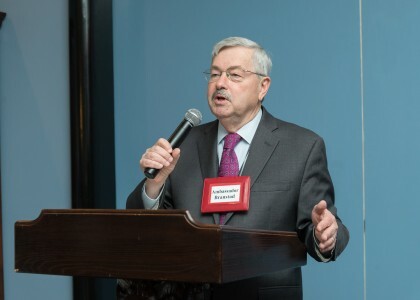 Branstad served as governor of Iowa for 22 years and four months, during which he remained friends with Xi Jinping and visited China twice before his appointment as Ambassador to China. Branstad urged the students. “Get to know the Chinese people from all walks of life – I guarantee the experiences you have will be very transformative”. Branstad also noted that he had a personal goal to visit every Chinese province at least once during his tenure. President of the U.S. China Strong Foundation, Travis Tanner, echoed Ambassador Branstad, “I encourage all students to not only take advantage of every opportunity you have while you study, live, and travel in China, but also to persuade your classmates, friends and family members back in the United States to follow in your footsteps.” Mr. Tanner extended an invitation to all students in attendance to join the US-China Strong Student Ambassador Program. Branstad also noted that the U.S.-China relationship is consequential for not only our two countries but also for the world. 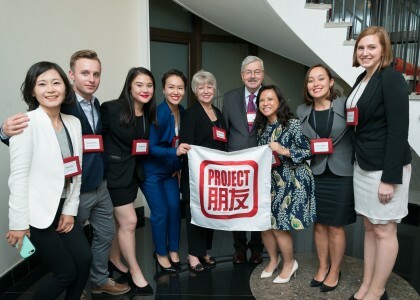 He said, “If we can build win-win relationships, it will not only benefit us but the entire world.” Branstad also thanked Project Pengyou and the U.S.-China Strong Foundation for long-term efforts to build a community to foster people-to-people diplomacy and friendly relations between the United States and China. 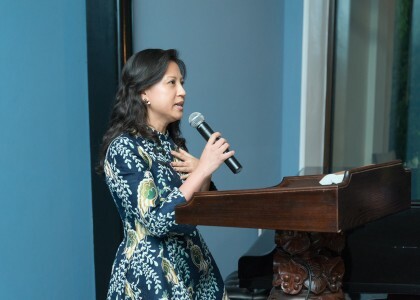 “These two groups helped prepare and sponsor this event tonight, and are making great strides to bring the U.S. and China together starting with students”. Project Pengyou (“Pengyou” means friend in Mandarin Chinese) is a flagship initiative of the Golden Bridges Foundation that fosters U.S.-China youth leadership. 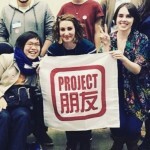 Conceived in 2011 as a public-private partnership with the State Department to build a global community of Americans with firsthand China experience, Project Pengyou has since trained over 200 youth leaders and launched over 50 Project Pengyou campus chapters across the United States to empower young Americans and Chinese to serve as active U.S.-China bridge-builders. 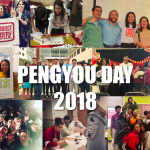 Backed by funding from the Ford Foundation, Project Pengyou chapters organize events and national U.S.-China youth campaigns, with a growing footprint in coastal and interior states, including New York, California, Kentucky, and Iowa. In addition, Project Pengyou maintains a dynamic online resource hub with over 7,000 members, and hundreds of China related jobs, events and exchange programs. The US-China Strong Foundation is a nonprofit organization that seeks to strengthen US-China relations by investing in a new generation of leaders who have the knowledge and skills to engage effectively with China. 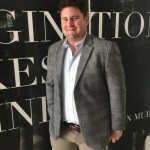 Established in 2013 as the 100,000 Strong Foundation – and relaunched in 2016 as the US-China Strong Foundation – US-China Strong leads three signature campaigns that focus on supporting the full spectrum of American youth, spanning from our youngest students through young professionals entering China-related careers. 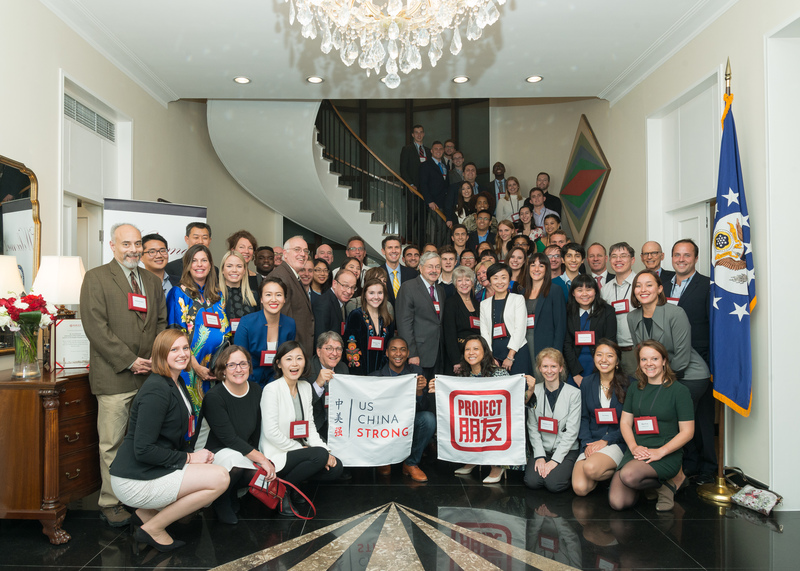 1 Million Strong; 100,000 Strong; US-China Alumni Ambassador Network. Please visit www.uschinastrong.org. View more event photos at our photo gallery. Team Pengyou with Mr. & Mrs. Branstad! Ambassador Terry Branstad encourages more Americans to study in China. Holly Chang, founder of Project Pengyou, gives her welcoming remarks. 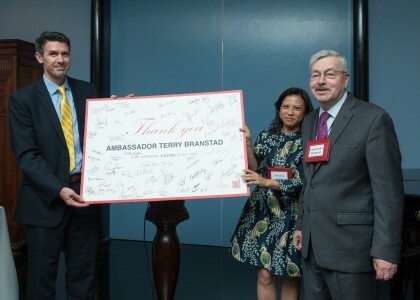 Travis Tanner, President of The US-China Strong Foundation & Holly Chang, Founder of Project Pengyou, present Ambassador Branstad with a signed gift from all the guests. Friendship with caring and kindness !